Spend a day cruising among archipelagos, swimming and snorkeling, and visiting hidden coves and beaches on this full-day boat tour from Omis. Following pickup from your hotel, you’ll be transported to the harbor and will hop aboard your vessel. 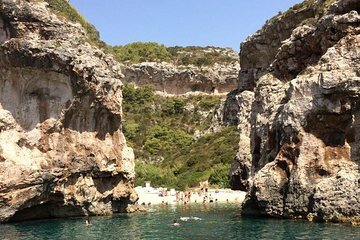 Head first to Bisevo Island and its famed Blue Grotto before continuing to the neighboring island of Vis, where you’ll take in the scenery of beautiful Stiniva Beach. Continue to several other islands and coves before stopping at Hvar Town, where you’ll have time to sightsee before returning to Omis.